Great catering can be crucial to the success or failure of an event. Planners put a tremendous amount of time and energy into making sure their events go off without a hitch—it’s important to have a catering partner that will do the same. For an event that runs smoothly, check out these 10 great catering options in Maryland. For the last 85 years, Ridgewells Catering in Bethesda, Maryland, has provided high-end catering to the Maryland and D.C. areas. They are a frequent International Special Events Society (ISES) award-winner, having won awards in multiple categories, including “Most Creative Solution,” “Best Under 50K,” and “A Slam Dunk” event. For your next corporate event, wedding, or celebration, you won’t do much better than Ridgewells. Corcoran Caterers in Silver Spring, Maryland, has been in business since 1984 and has recently earned the distinction of being a “Green Restaurant,” as certified by dinegreen.com. They’ve won Wedding Wire’s Bride’s Choice Awards every year since 2011, too. They are happy to cater weddings, events, and corporate events and will customize specifically for you. 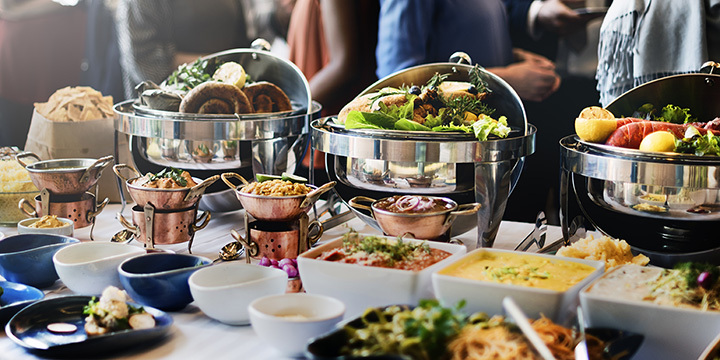 Since 1986, The Prime Choice Caterers have serviced the Virginia, Maryland, and D.C. areas with “delicious creations and outstanding hospitality.” Their menus are diverse and can be adapted to fit the most formal occasion or informal gathering. They offer corporate, wedding, event, and holiday catering. La Prima Catering, based in College Park, Maryland, serves Virginia, Washington D.C., Maryland, and Pennsylvania. Stop by any of their seven locations across the four areas for a one-on-one experience. They provide catering for every occasion, with options for breakfast, lunch, and dinner. Martins Caterers is “the leading catering company in the Baltimore, Maryland and Washington D.C. areas,” according to their website. They received the Couples’ Choice Award from Wedding Wire and have been featured on the Knot website. They are well-versed in catering public events, weddings, receptions, banquets, dinners, corporate meetings, expos, trade shows, feasts, bull roasts, box lunches, Quinceañera days, and more. Santonis is a family owned-and-operated business with a marketplace and off-site catering option. They cater all kinds of events ranging from corporate gatherings to weddings, and have strong relationships with local venues. Prepared food is prepared at their marketplace and delivered in time for your event. The Classic Catering People has distinguished themselves many times over. They are part of Leading Caterers of America, a member of the Maryland Green Registry, and the official caterer for the Baltimore Ravens training facilities. In addition to sports events, they cater weddings, galas, corporate events, gatherings, and picnics. @irvinenaturecenter tonight for Raptors, Rehab & Riesling serving Apple Vinegar Brined Pork Loin with Housemade Sauerkraut with Ham Hocks. Whitehouse Caterers provides custom menus for all kinds of events, designed “suit your individual styles and tastes.” Not only will they cater, but they can also plan your event for you and are known for their excellent hospitality. If you’re in Catonsville, Maryland, or the surrounding areas, definitely check them out. Zeffert and Gold Catering is one of the top wedding catering options in the Baltimore-D.C. area. They continue to grow, with corporate event and bar and bat mitzvah catering options. They have won numerous awards, including Wedding Wire’s Couples’ Choice Award and the 2016 pick for the Knot’s best of weddings. Beefalo Bob’s offers a break from some of the usual catering options with good-old-fashioned barbecue. That’s not to say that Beefalo Bob’s doesn’t provide fantastic service and delicious food! They offer a wide variety of food choices, including ribs, chicken, chicken and barbecue, pig roasts, wedding options, and much more.